The Concrete Masonry Products Research, Education and Promotion Act, authorizing concrete block and brick stakeholders to pursue an industry-wide referendum on a national commodity checkoff program, was signed into law last month as part of the Federal Aviation Administration Reauthorization Act of 2018. 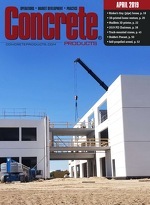 If modeled after other national programs, a concrete masonry unit checkoff could entail collection of one or more cents per building block or brick sold, with a producer-contractor board allocating funds to research, education and promotion activities—all under federal agency oversight. Weighing construction industry bargaining relationship provisions per National Labor Relations Act Sections 8(f) and 9(a), the National Labor Relation Board invites stakeholder briefs through the end of this month on whether the agency should revisit policy dating to the Casale Industries (1993) and Staunton Fuel & Materials (2001) cases. From “Building Bridges Better – Ultra-high performance concrete creates strong, long-lasting connections,” Federal Highway Administration Center for Accelerating Innovations’ Innovator, Issue 67 … The use of ultra-high performance concrete (UHPC) to make better field-cast connections between prefabricated bridge elements (PBEs) is advancing across the United States. Transportation agencies have used the steel fiber-reinforced, portland cement-based composite material on 100-plus projects since the nation’s first bridge incorporating UHPC was completed in Iowa in 2006. Half of those structures were built after the Federal Highway Administration began encouraging deployment of UHPC connections for PBEs through Every Day Counts (EDC) in 2015. A 1916 rule enacted by President Woodrow Wilson’s administration is curbing 21st century transportation innovations that could improve safety and quality on the nation’s major roadways, the American Road & Transportation Builders Association (ARTBA) notes in recent testimony submitted to the U.S. House Highways & Transit Subcommittee. Adapted from “Timing is Everything: The Model Timing Agreement,” by Bruce Hoffman, U.S. Federal Trade Commission Bureau of Competition … Recent FTC Bureau of Competition initiatives are geared to streamlining the merger review process in order to reach swifter resolutions—whether that be clearance, a negotiated settlement or lawsuit. As part of these efforts, the agency has codified a new Model Timing Agreement for Bureau reviews.